Friday night was frustrating. On my way to pick up the other half from the train station, I get pulled over by a cop who gives me a ticket. Then my car won’t start and the cop just drives off. Triple A comes and saves me and lover drives home. What a sucky start to the evening. So sucky that we decided to pull out our Valentine’s Day wine and drink it with our Matzoh pizza–what Jews eat during Passover, imagine mushroom, spinach, goat cheese, mozzarella, and pizza sauce over a thin, crackery crust. We missed out on the Valentine’s Day wine, which we had been saving since our Paso Robles trip Valentine’s 2013 because we were traveling in Argentina this past February, drinking lots of Malbec. 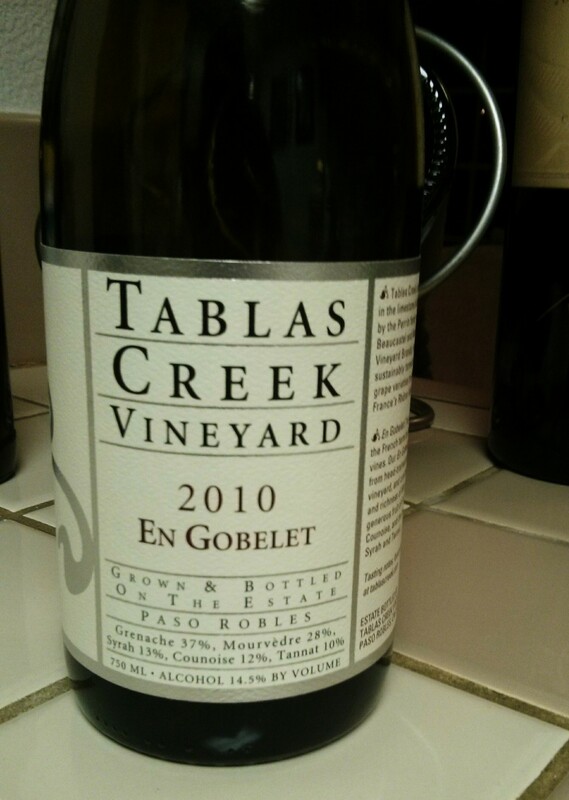 We had picked up the 2010 Tablas Creek En Gobelet while wine tasting and with the happy memories of our first trip to Paso Robles flowing, we uncorked the bottle. On first sip, though, I was disappointed. The wine had this unpleasant alcoholic burn. After letting it air for a bit, though, the burn mostly disappeared and was replaced by a pleasant warmth. This red was pungent, bold and definitely had characteristics of Grenache and Mourevadre, the two big players in the blend. The Grenache gave it this long-lasting flavor and full-mouth feel, while the Mourevadre gave it a gaminess of sorts, which was hard to get used to. 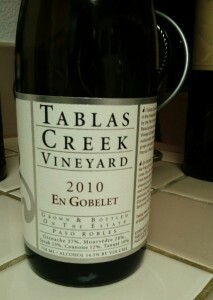 It wasn’t too fruity, as I’d expect from a Grenache, and it wasn’t jammy like Mourevadre blends I’ve had in the past. The Syrah and Tannat made it dark and smoky. It reminded me of a dark chocolate flourless cake,which I’m not a super fan of. Not in the flavors, there was some chocalatyness to it, but that was in the background; rather in the hit or miss quality. Flourless chocolate cakes always sound so good to me, but then the intense flavors can overwhelm. This is a slow-drinker; not a gulpable wine. When to drink: After you let this wine aerate for a bit, drink it while reading on your tablet. This is a slow-drinking wine, perfect for swigs every now and then.